Shire Corner Garden Shed: The Shire Corner Sheds range of two garden sheds makes ideal use of a corner in the garden. 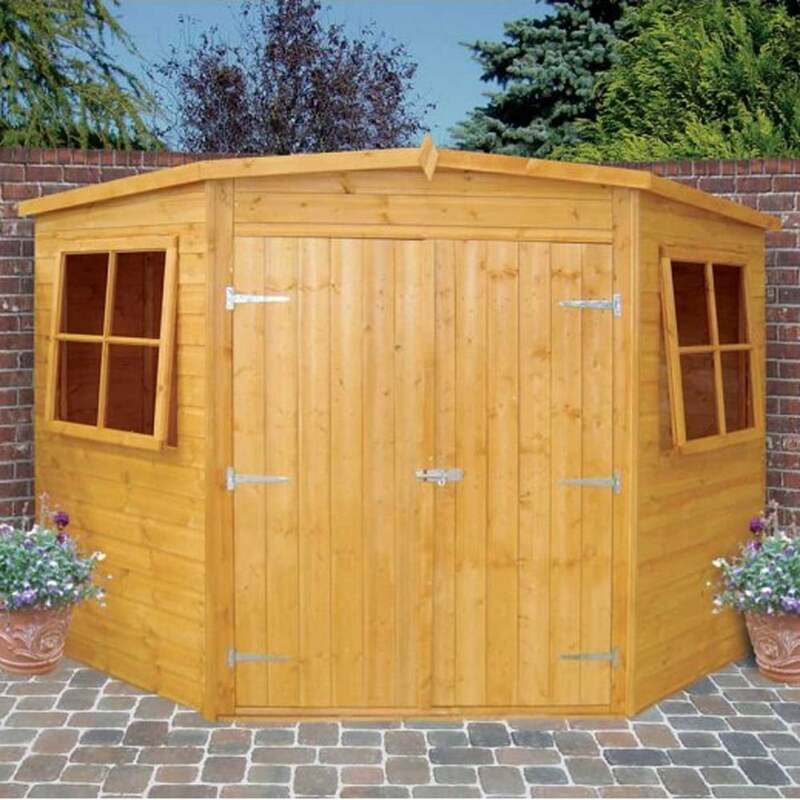 The Shire Corner Shed is available in two sizes: 7ft x 7ft and 8ft x 8ft (nominal sizes). Delivered in easy to manage sections the corner garden sheds are a simple storage solution in the garden. Both sizes feature Double Doors and Two opening criss-cross style windows. Showing our 2 Shire Corner Shed Double Doors|Low Roof reviews with an average rating of Very Good. Would you like to write a review? Review - Shed looks great. 99% single person assembly. Areas where it could have been better: a). Two base sections do not have tongue and groove joint. b). Roof needed a little adjustment to fit (as stated in the instructions to be fair). c). Plan you cuts of the roof felting carefully. If you just follow the instructions, you will not have enough felt. You need to roll it out and plan a diagonal cut then it will work out fine. Overall though, delighted with ease of construction and it is a really good quality product. Looks great. Display Name - Mr. B. Shed looks great. 99% single person assembly. Areas where it could have been better: a). Two base sections do not have tongue and groove joint. b). Roof needed a little adjustment to fit (as stated in the instructions to be fair). c). Plan you cuts of the roof felting carefully. If you just follow the instructions, you will not have enough felt. You need to roll it out and plan a diagonal cut then it will work out fine. Overall though, delighted with ease of construction and it is a really good quality product. Looks great. Review - First of all, delivery was exactly when expected and done very professionally. Great service there and this shed was considerably cheaper from gardenchic than a lot of other places, it was the cheapest I could find online. As for the shed itself, the floor is flimsy as others have said and needed some extra bearers putting across. The rest of the shed seems really good quality by contrast. Everything fits together nicely and looks splendid when its all finished although the glass is tricky to fit, I broke two panes. It does take a long time to erect but its worth it for such a great looking shed. Delivery was exactly when expected and done very professionally. Great service there and this shed was considerably cheaper from gardenchic than a lot of other places, it was the cheapest I could find online. As for the shed it seems really good quality. Everything fits together nicely and looks splendid when its all finished although it does take a while to erect but its worth it for such a great looking shed.